People who suffer with allergies or penny pinchers who enjoy saving money during the holidays may use artificial Christmas trees, such as those sold by home decorator Martha Stewart. If you purchase a secondhand tree or lose your instructions, you may find assembling your artificial tree challenging. There are different kinds of trees in the Martha Stewart collection, including the kind that come prelit and rotate to holiday music. Learn how to assemble your tree correctly so you can enjoy 360 degrees of Christmas beauty. Locate the tree stand inside the box. 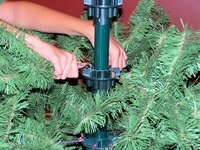 Set the tree stand in the spot you have chosen to assemble your tree and unfold it. Unscrew the bolts on the sides of the tree stand so you can drop in the tree base. Look in the box for the bottom of the tree. This should be the largest, bushiest section with the longest limbs. Center the pole in the tree stand hole and drop the pole in. The branches will unfold. Tighten the bolts on the tree stand. This will prevent your tree from tipping over later. Look in the tree branches for the electrical outlet for the lights. Plug the outlet into the wall to test this first section of lights. The Martha Stewart guarantee promises that your tree lights will work even if a bulb goes out, but you should still test your tree. Fluff the tree branches out and shape them to your desired look. Curve the tips of the branches slightly upward. Take the middle section out of the box. Line up the electrical cord with the bottom cord. Plug them into one another. Shape the branches and fluff them out. Remove the last section from the box. Fluff the last portion before adding it to the top of the tree. Line up the electrical plugs and snap them together. Blend the three sections together by moving the branches around.